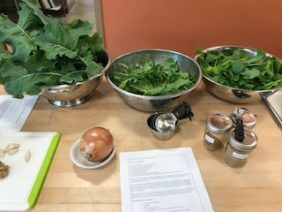 On Tuesday, the SEEDlings harvested bunches of the nutritious green. 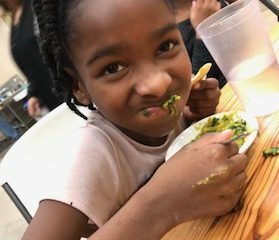 On Wednesday, they cooked it into saag and prepared fresh naan with Sumi in the kitchen. 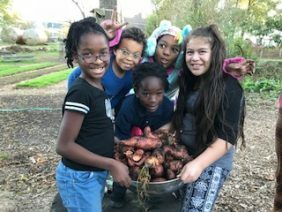 On Thursday, they harvested even more, and at the end of the week, each SEEDling’s family took home a bag of fresh greens and sweet potatoes! Cauliflower Purée: Combine rice milk and cauliflower in a small saucepan. Season with salt and bring to a simmer. Cook until cauliflower is tender, about 10 minutes. Purée mixture using a hand blender or counter-top blender. Set aside. For the Spinach: Heat vegetable oil in a large saucepan or saucier over medium heat until shimmering. Add onion, a pinch of salt and cook until caramelized. Add garlic and ginger and cook, stirring, until fragrant and lightly browned, about one minute. Add coriander, cumin, turmeric, stirring until fragrant, about 30 seconds. Add spinach and other greens one handful at a time, stirring and adding more as the greens wilt. Reduce heat to low and cook, stirring occasionally, until greens are fully wilted, about 5 minutes. Stir in cauliflower purée and continue to cook until greens are very tender, about 5 minutes longer. Squeeze lemon juice on top, season with salt, adjust consistency with a little water if necessary, and serve. For do my homework more tools, check out these collections creativity & design tools a collection of web-based tools & apps for creativity and design.